Elysha O'Brien and her husband, Michael, with their sons. Elysha never learned Spanish but is determined that her children will. 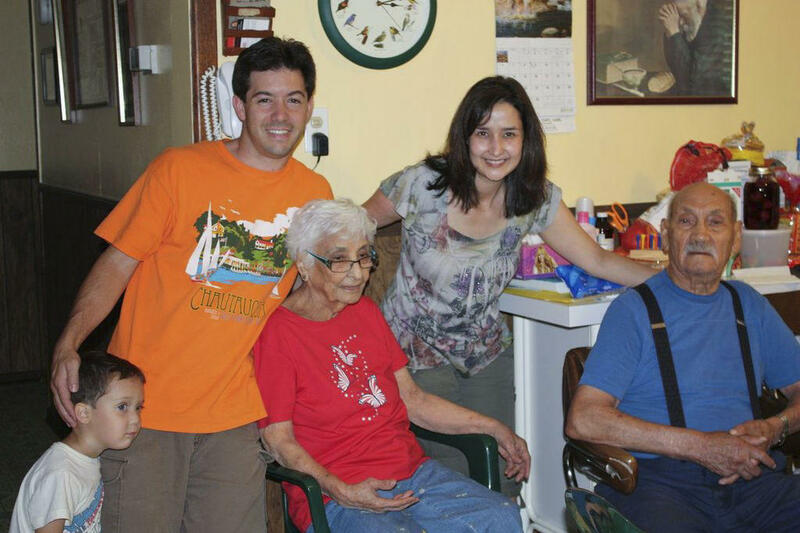 Elysha, husband Michael and one of their sons with Elysha's grandparents, Evelia and Homer Patino. 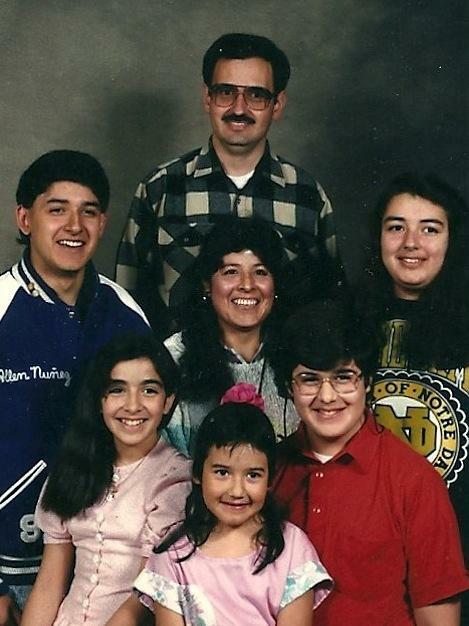 Allen Nunez Wickham (far left) with his family in the early 1990s. His grandmother chose not to teach his father Spanish, and Nunez Wickham also never learned. NPR continues its conversations about The Race Card Project, where NPR Host/Special Correspondent Michele Norris asks people to send in six-word stories about race and culture. The submissions are personal, provocative and often quite candid. When Elysha O'Brien, a college professor in Las Vegas, decided to submit six words about her cultural identity, she knew exactly what she wanted to say: "Mexican white girl doesn't speak Spanish." Like many others who have written to The Race Card Project, she grew up in bilingual household but never learned the language of her elders. O'Brien says she often feels like she has a foot in two worlds, but is never fully accepted in either. Whites often assume she is Greek or Mediterranean because her face is slightly angular and her skin fairly pale. But when she encounters others who share her Mexican heritage, they often don't pick up signals that suggest cultural camaraderie. "When I go into a community of Hispanics, they just assume that I'm white," O'Brien says. "Once we start talking, sometimes they'll say, 'Well, why don't you speak Spanish?' And I say, 'Well, my parents didn't teach me.' "
O'Brien was raised in a household where both parents spoke Spanish — but not to their children. The couple made a collective decision to ensure the next generation mastered English without the hint of an accent. Spanish was the secret language they used when they argued or talked about Christmas presents. O'Brien's father is one of eight children, and among her 25 cousins, all but three speak English only. When she asked her parents, aunts and uncles why they didn't pass on their native language, they all gave the same reason: They faced bias, or worse, when speaking Spanish outside the home. They were rapped on the knuckles at school or denied jobs and other opportunities. Her family experienced so much prejudice in Fort Worth for speaking Spanish in school that they didn't want their children to endure that, O'Brien says. "They didn't want their children to get slapped on the wrist, they didn't want their children to get shushed in the lunchroom. They wanted their children to assimilate into the culture." O'Brien absorbed that message, she says. At one point in her teen years, she would de-emphasize her heritage when other Mexican-American kids would tease her for not speaking Spanish, she says. "It was my parents' language; it wasn't my language. When you're kind of rebellious and you're trying to find your identity, I used to say, 'Well, I'm not Mexican, my parents are.' "
As an adult, even saying those words out loud is difficult for O'Brien. "I think it sounds very flip. It sounds very much like I'm trying to make amends for a really deep wound — just trying to put a Band-Aid on something instead of digging out the infection that's there," she says. O'Brien, who has a doctoral degree, now says she emphasizes her Latino heritage out of pride. But she also hopes her career path and education might serve as a beacon for others. For years, she never asked her students to address her as "Dr. O'Brien"; "professor" or even her first name would do. But that changed when she met a Latina student who gushed about meeting a Mexican-American Ph.D. for the first time. Now, she says, "I do make a point to tell people, 'Hey, I'm Mexican and I'm a female and I have a Ph.D. There are not very many of us who have all of those three things." 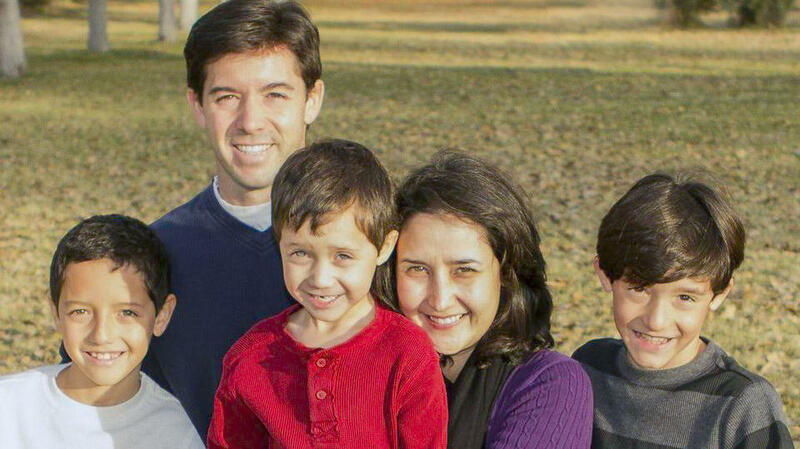 O'Brien and her husband, an educator of Irish and Italian descent, have three boys — a blend of cultures not easily captured on official forms. Recently, O'Brien says, she had to fill out a form for her children that required checking a box for ethnicity. "And there was a box for "white," there was a box for "black," a box for "Asian" and a box for "Hispanic." "And my son says, 'Well, where's the Italian box?' " O'Brien recalls. "And I said, 'Well, that's just if you're white.' And he goes, 'And what about Irish?' I said, 'Well, that's white, too.' "
"But Hispanic's there and Italian isn't?" her son asked. "And ... I couldn't really answer him," O'Brien says. "But it's interesting that when you look at the Hispanics ... Mexicans are very different from Cubans, and Cubans are very different from Puerto Ricans, and Puerto Ricans are very different from Peruvians. But yet we are all lumped together as Hispanic, and we are all assumed to ... speak the same language." O'Brien is determined that her sons will speak both English and Spanish. She hopes that will deepen their relationship with their Mexican-American grandparents. The elders on her family's side, she says, display a more gregarious part of their personality when speaking in their native tongue. As an academic, she says she also wants her boys to have the "brain plasticity" that learning another language allows. And, while her parents experienced bias when speaking Spanish in public decades ago, O'Brien says she would have greater opportunities if she had dual language skills today — and wants her sons to have that advantage. She acknowledges that her sons will ultimately decide how to identify themselves as adults, but she wants to make sure they emphasize their Hispanic roots when seeking opportunities, like applying to college. "My children have the O'Brien last name and they're all fair-skinned and they appear white," O'Brien says. But when filling out school forms, "I always make sure I check off that 'Hispanic' box. Because I know that as a white male, they're not going to be given certain privileges as if they were a Mexican male, which perhaps is slightly racist on my own part, but I want them to be able to have access to things." Allen Nunez Wickham lives In Molalla, Ore., just outside of Portland. He sent his six words to The Race Card Project knowing his father would play a prominent role in his submission, "Grandma didn't let Dad speak Spanish." Both of his parents came to the U.S. from Mexico as children. Because he doesn't speak with a noticeable accent, he "passes" or blends in better with other ethnic groups. Consequently, Nunez Wickham says, he's heard charges that "he's not really Mexican" because he doesn't speak Spanish. "After a while," he says, "I just started calling myself Chicano because it was like more of an American-Mexican." But his family displays "Nunez," his mother's maiden name, with pride. "I use it deliberately," he says. He spoke with NPR's Michele Norris about the pros and cons of being closer to his family's cultural heritage. Our own Steve Inskeep is headed today to the Middle East on assignment. Before he left, Steve sat down - as he often does - with NPR special correspondent Michele Norris, to talk about the Race Card Project. Michele has been asking people to submit six-word stories about race or cultural identity; stories like this one. ELYSHA O'BRIEN: My name is Elysha O'Brien, and my six words are: Mexican white girl doesn't speak Spanish. I chose these six words because whites see me as Mexican; Mexicans see me as white because I don't speak Spanish. I find it interesting that we don't qualify other ethnic identities on the basis of language. STEVE INSKEEP, BYLINE: OK. So Mexican white girl doesn't speak Spanish - those are the six words from Elysha O'Brien, who lives in Las Vegas, Nevada. And to talk about the meaning behind those words, Michele Norris joins us once again. Hi, Michele. MICHELE NORRIS, BYLINE: Hey, Steve. INSKEEP: And I guess this is a moment to remember that when we say Hispanic, that's not a racial identity. There are lots of races of people who are Hispanic; it's about the language. NORRIS: Well, and it's about the culture. And in this case, it's specifically about how the language and the culture are intertwined. And this represents one of those themes within the Race Card Project. We have received a lot of submissions from people who are Latino but don't speak Spanish, even though their parents spoke Spanish. They come from households where their parents made a deliberate choice that their kids were going to become more American, whatever that means; that their ambitions were wrapped up in making them more American. And for them, that meant making sure that they spoke perfect English. And even though the parents spoke Spanish, they didn't pass that onto the kids. INSKEEP: How did Elysha end up not speaking Spanish? NORRIS: Well, she was raised by parents who hail from Mexico. [POST-BROADCAST CORRECTION: Both of Elysha O'Brien's parents were born in the United States.] They spoke Spanish but in her household, Spanish was almost like the secret language - the language that the parents spoke when they didn't want the kids to hear about a tragedy in the family, or where the birthday presents were hidden. NORRIS: Yeah. And they decided not to pass on their language skills - and that's what she calls them now, language skills. They didn't pass on their language to the kids for those same reasons. They wanted to make sure that they did well in school, but they also did it in part because of their own memory. She explains that. O'BRIEN: I have talked to my father about this, and I've talked to my aunts and uncles individually about this; and they all give me the same reason. They said that they were so prejudiced against - growing up in Fort Worth, Texas - for speaking Spanish in school that they didn't want their children to endure that. They didn't want their children to get slapped on the wrist; they didn't want their children to get shushed in the lunchroom. They wanted their children to assimilate into the culture. NORRIS: They were rapped on the knuckles if they spoke Spanish in class? O'BRIEN: Yeah. They were - ears were turned; rapped on the knuckles; just - a bit of humiliation would occur if they spoke Spanish. My father failed first grade because he didn't speak English. You'd never hear of that now. He only spoke Spanish, and so he wasn't able to proceed to second grade. He had to repeat first. INSKEEP: Michele Norris, this is such a classic immigrant tale. People come; they bring other languages, they bring other cultures. They are determined - many of them - to fit into the new country, or to make sure their kids fit into the new country. NORRIS: And often, fitting in means speaking the language of the new homeland. And here in America, that - of course - means English. And that's why Elysha O'Brien's parents didn't speak Spanish to her, in part because of those memories of days before you had English-as-a-second-language classes in school, where they were penalized for speaking Spanish; but also because they wanted to give her something. And so, as she explains, she lives in this position where she has sort of a foot in two worlds and doesn't necessarily feel fully accepted in either, particularly when she is challenged by other Latinos who say, well, you're not really Mexican, if you don't speak the language. And over time, she really started - particularly when she was young - to internalize that criticism and really question herself. O'BRIEN: Spanish always sounded like a bird singing to me. It was - my mom would watch the Mexican soap operas, and the women always sounded like they were chirping. And it was so fast and so quick, I couldn't discern where one word ended and another word began. It just all had this very musical quality to it. I couldn't tell. But it was just something I didn't have. It was my parents' language; it wasn't my language. I used to say to a friend - actually, when you're kind of rebellious and trying to find your identity, I used to say, well, I'm not Mexican; my parents are - because of the comment that my friend said to me - well, not really my friend; but the comment that he said - well, you're not Mexican 'cause you don't speak Spanish. I think in trying to figure that out, I started responding to people, well, I'm not Mexican; my parents are. NORRIS: How does that strike your adult ear now? O'BRIEN: I think it sounds very flip. It sounds very - like I'm trying to make amends for a really deep wound, just trying to put a Band-Aid on something instead of digging out the infection that's there. INSKEEP: So this gift that her parents worked so hard to give her - the gift of being sure that she knew English really, really well - does she regret not having learned Spanish? NORRIS: It sounds like the whole family has a little bit of regret around this. Her parents regret it now because they recognize that their children might be more marketable if they actually were bilingual. INSKEEP: Spanish is an asset in the globalized world. NORRIS: Yes, particularly if you live in a place like Las Vegas. So there's regret around economic opportunity. Elysha regrets it for two reasons. One is academic, and one is a little bit emotional. And the academic side - she's a college professor - she would love to be able to read Gabriel Garcia Marquez in his native language; she would love to be able to dream in Spanish. She would love to be able to tackle a language and really learn how to master it, as an academic. On the emotional side, she says that there's a piece of her family, of her elders in her family, that's not available to her because she doesn't speak their native language. But when they speak their native language, that there's something musical about them; that's something that comes out. And she says that most clearly when she talks about her grandmother, who passed away two years ago. O'BRIEN: Whenever we would go to Texas, the only thing that she knew how to say in English was "I love you, mija, I love you." And so she would say this to me over and over again - "I love you, mija, I love you." For, I think, the first seven years of my life, I thought my name was mija. I didn't realize that mija was an individual word in Spanish. I thought it was my nickname. NORRIS: What does that mean? O'BRIEN: It means "my daughter," in Spanish. It's actually a shortened, condensed version of "mi hija." "Mi hija" means my daughter; "mi hijo" means my son. And "mija" is just a shortened version of those two words. NORRIS: What do you lose, when you lose your language? O'BRIEN: I think you lose home. I think about my grandmother and how I wasn't able to communicate with her, and that sense of relationship that I lost. NORRIS: If you could speak Spanish with your grandmother, what is it that you would say? O'BRIEN: I love you, mi amor, abuela. INSKEEP: I love you, grandma - the words that Elysha wishes she could say in Spanish, if she could speak it. Now, Michele, we should mention that Elysha has three boys of her own. Does she want them to learn Spanish? NORRIS: Elysha is married. Her husband is Irish and Italian; thus, the last name O'Brien. And she has three sons, and she is going to make sure that they all are bilingual. And if you go to the website, you'll learn more about that. INSKEEP: Michele Norris is curator of the Race Card Project. Michele, thanks for coming by. MONTAGNE: And you can learn more about Elysha O'Brien and the Race Card Project at our website, NPR.org. Transcript provided by NPR, Copyright NPR.